Alongside Watersidewhich leads to the Royal Shakespeare Theatre is the Canal Basin. 100 years ago this would have been surrounded by warehouses, as Stratford was an Inland port with all the canals used for carrying heavy industrial loads. Nowadays the majority of our canals are used for holidays. It is not unusual to see the narrow boats moor in the basin for an overnight stop or for a few days. 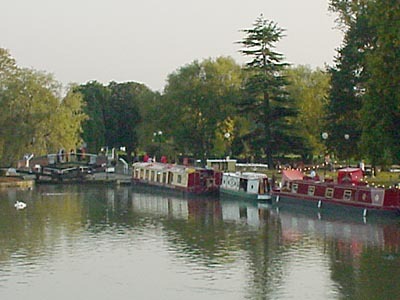 The narrow boats leave the basin and join the River Avon using the lock at the far end of the basin. In additon to these boats you will be able to find barges permanently moored offering a selection of wares, from ice ceams to oil paintings, including a very special canal boat that offers dinner whilst transporting you gently up river. A remarkable dining experience to celebrate that special occasion. Periodically Sunday Markets are held on the Waterside.